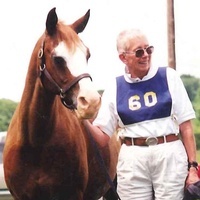 Rebecca Hanna Spicer (Bucky) died on January 9, 2019 at Homewood of Crumland Farm in Frederick, Maryland. Her husband, John S. Spicer, Sr., predeceased her on June 3, 2017. She was born in Franklin, Pennsylvania on October 2, 1929. She was the daughter of Rebecca Sponsler and John Richard Hanna. Bucky’s first six years were spent in Franklin where she fell in love with horses. Her grandfather, John Lindsay Hanna, was business manager for the Sibley Estates, where they would let Bucky ride one of the team horses at lunch time. In 1936 her father was transferred to Philadelphia, Pennsylvania with Atlantic Refining Company, then she grew up in that area. She attended the Shipley School in Bryn Mawr, Pennsylvania then attended the Ambler branch of Temple University where she majored in agriculture and acquired her first German Shepherd. She made her social debut in Philadelphia in 1947. 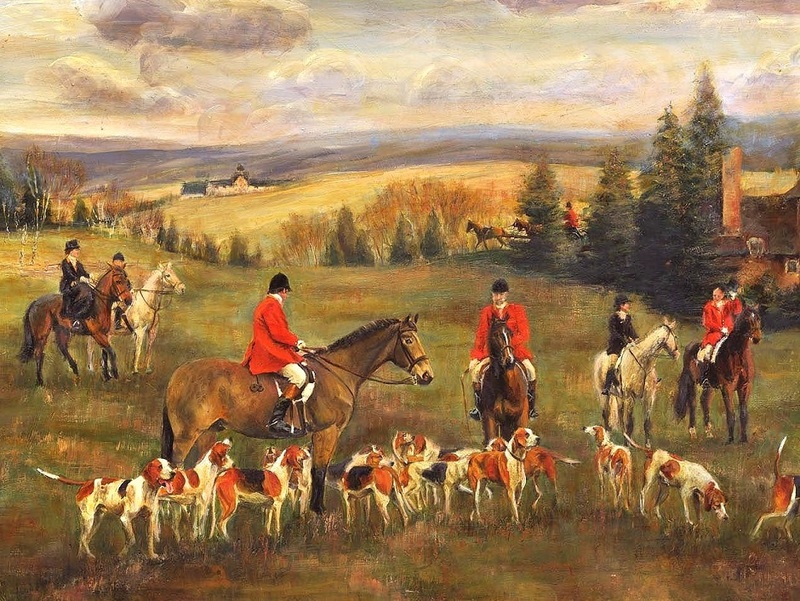 When her parents moved to Sewickley, Pennsylvania, she fox hunted several years with the Sewickley Hunt Club. She then attended Penn State and became a milk tester. She traveled the state with her dog Brandy, doing advanced registry and AHR testing. Wanting to stay in one place, she became a Dairy Herd Information Association (DHIA) tester for Adams County, Pennsylvania where she met her future husband. During that year she was whipper-in for the Beaufort Hunt Club in Harrisburg. She was then head of the riding department at the Gunston School in Centreville, Maryland and head of the riding department at Happy Valley Camp in Port Deposit, Maryland, always accompanied by her dog. In 1955 she married John Stephen Spicer of Gettysburg, Pennsylvania. They spent the first year of their married life at the farm he managed with his father and brother before moving to Sewickley, Pennsylvania for three years. Daughters Susan Rebecca and Sara Stephenie were born in Pittsburgh, Pennsylvania. John was transferred to Bowling Green, Kentucky where Bucky established herself as the first female real estate agent in Bowling Green, and where son John Stephen, Jr. was born. John was transferred back east where the family settled in Frederick, Maryland. Bucky became a real estate agent with Baker Kefauver before becoming a residential sales manager for Paul Ganley. During this time, she was on the Altar Guild at All Saints Episcopal Church and was also the Organizing Regent for the Carrollton Daughters of the American Revolution. In 1969 the family moved to a farm in Woodsboro, Maryland, which they named Johnny-Reb Farm. Bucky became a whipper-in for Carrollton Hounds and then for the New Market Hunt Club. She was the first female director of the Maryland Angus Association. Bucky hosted the first handicapped riding program in Frederick County. During those wonderful years with the children in Pony Club and 4-H, school and college, she bred and showed thoroughbred horses and even showed an Angus bull at the Frederick Fair. She started her competitive trail riding era in 1975 with horses Pywacket, Admiral Boy and Dagget. In 1992 she acquired an Arabian gelding named Bart (Caynga Vartan). The two of them won numerous championships and had over 6,000 miles in competition, besides the thousands of miles during training and pleasure rides. A highlight was when they completed the Old Dominion 100 mile one-day endurance ride. Bart won the Arabian Horse Association’s Legions of Honor, Supreme Honor, and Excellence, and was Horse of the Year before Cushing and Lyme disease forced him into retirement. He died on June 23, 2014. In 1999 John and Bucky designed and built a house on the top of a steep mountain off of Bethel Road in Frederick, Maryland, which they named Johnny-Reb at Uphill. Bucky enjoyed riding into the watershed and the mountains from the barn. They resided at this location until February 1, 2016 when they moved into Homewood at Crumland Farms in Frederick, Maryland. Bucky was the honorary Homewood Ambassador, where she was well known by all residents and staff. During her stay there, she always wanted to be back on the farm, mucking stalls and surveying their property on her Kawasaki Mule 4X4, followed by her German Shephard dog Terp and poodles Lacey and Katie. After John’s passing, she resided in the Meadows at Homewood where her room was filled to the brim with photos of her family, a large painting of the family pig Pygmalion and horse Bart, bibles and church bulletins, and Hershey kisses. She is survived by her daughters Rebecca and husband, Richard Himes of Middletown, Maryland and Sara Stephenie and husband Sam Hall of Elkridge, Maryland; son John Stephen and wife Terri of Walkersville, Maryland; her grandchildren Sara and husband Patrick Riley of Ellicott City; Maryland; Anastasia Himes of New York City; Taylor and husband Richard Pearch of Seattle, Washington; Rachel and Lili Spicer of Walkersville Maryland; and great grandson (finally a boy!) Colin Riley. She was preceded in death by her sister Emily and husband Richard Murray. She was a member of Brook Hill United Methodist Church and an avid church attendee at both Sunday services at Homewood. A Celebration of Life will be held on January 22, 2019 at 11:00 a.m. at Brook Hill United Methodist Church, 8946 Indian Springs Road, Frederick, Maryland. In lieu of flowers, memorial contributions may be made to the church or to Hospice of Frederick County. Mom and Dad received tremendous support from Homewood, Brook Hill Church, and Hospice for which the family is most appreciative. A private interment will be held at a later date. © 2018 - 19 Keeney & Basford P.A. Funeral Home. All Rights Reserved.